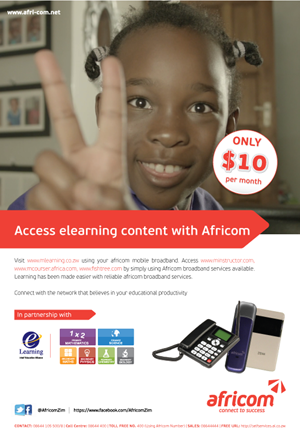 Africom has partnered with local digital education provider, e-Learning Solutions, in the roll out of e-learning content which includes the mcourser platform that was launched in June this year. Their new package gives Africom broadband subscribers unlimited access to www.minstructor.com, www.mcourser.africa.com and www.fishtree.com for $10 per month. This is meant to ease the data burden for scholars whose access to the services of these digital learning content solutions is unlimited for every subscription package they select. Looking for example at the mcourser platform, e-Learning Solutions’ latest product that provides online learning content for Maths and Science subjects, it has unlimited access to learning material priced at $2 per subject per month. The cost of data hadn’t been considered there, which is what a special data plan will come and rectify. The provision of special internet and learning packages from service providers is hardly new though. In February this year Powertel introduced the “Scholar Pack” offering college and university students unlimited surfing and downloads for just $0.50 per day. Econet Wireless also chimed in with its Econet Zero package that offers free internet access to fifty odd education sites for every Econet broadband subscriber.Through its EcoSchool initiative the network operator also introduced cheaper tablets to University students (albeit at a pilot stage) to ensure improved access to the internet as a virtual library. While all these initiatives are commendable the biggest thrust that seems to be missing is the access to locally generated learning content, a problem which also rests with the shortcomings of local content developers. There is a dearth of local learning material online and in digital form, something that apps like Mazwi have set out to address. Maybe these ISPs and networks should also look at subsidising or zero-rating those as well. eLearning Solutions provides education transformation solutions that are ICT based. They are an education company…..not a technology company. There is difference between e-learning and e-reading. Learners do not get engaged by page turners. They are boring. HTML, PDF and e-books that seek to automate education have a well documented negative Return On Education Investment. To define e-learning by the form of the content, being electronic, is not correct. Successfull e-learning companies provide e-learning support teachers, engage learners and promote excellence in learning., instead of automating old ways of doing things.